What should I blog about? 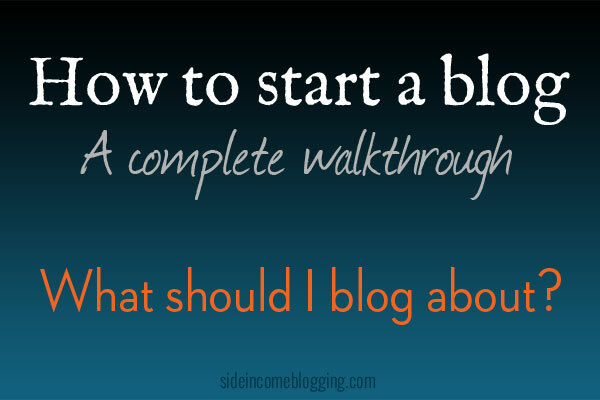 This should be the first question you ask yourself immediately after you ask the question: how to start a blog. Finding your niche in the blogging world is critically important to successfully growing a blog and earning an income from it. Finding a niche that you enjoy writing about and that people enjoy reading and receive value from is a proven strategy for developing a successful blog. Unfortunately, there isn’t an easy answer to this question, and getting to the answer requires some basic understanding of how the internet works and some insight into what you enjoy as well. Uunderstanding what I’m about to explain is the cornerstone to your success on the internet. Skip this part, or don’t give it the necessary amount of attention, and you will have failed before you even started. More than 100,000 blogs are created each day and 99% of them fail within 3 months because they don’t get the basic concept I’m about to explain. What is a niche and why is it so important? A niche is a specific sub-topic of a more popular and general topic. For example, Recipes is a popular blogging topic. Diabetic Recipes, Low Fat Recipes, Gluten Free Recipes would all be a niche topics of Recipes. Many people start a blog with the impression that if they just create the blog and write a few articles, it will magically begin showing up in Google’s search result pages almost immediately. These same people also believe that thousands of people will begin visiting the blog and the blog will suddenly earn the blogger tons of money. The reality is that it doesn’t work that way. I mean seriously, if it was that easy, we would all be rich. People also falsely believe that if they create a blog and tell their friends, that their blog will just virally spread out to everyone. That doesn’t happen either, unless of course you have millions of friends. Getting search traffic from Google should be your primary target. So let’s talk about that for a bit and at the same time, we’ll further answer the question: Why is finding a niche so important? Google is very particular about which sites it shows on it’s search results pages. Remember, Google is a business just like other companies, and one of their main products is their search engine. They have a very intense focus on making sure that the results shown to you when you type in a search query are on topic, very high quality, and tell you what you want to know. Go out and do a quick search on Google, say “macaroni and cheese recipe”. Pay attention to the first page, which contains the top 10 results. You should see 10 results that pretty directly tell you what you are looking for. Again, there are only 10 positions on that first page. That means that for popular search topics (like the one you just entered), hundreds of thousands of websites are competing for those 10 positions. Page two of the search results and beyond frankly don’t really matter. How often have you clicked on page two when looking for something? Probably not very often. This is where the niche concept comes into play: You want to find a niche that gets a decent amount of search queries, but yet one where you stand a chance of ranking on page 1. That is why finding a niche is so important, getting on page 1. Let’s look at an example to help drive this home. Using a Market Samurai (a really awesome research tool), I found that the search term Recipe is searched for approximately 32,877 times per day. That’s a boat load of searches. Logic would tell you that if you want lots of search traffic, than you should target Recipes right? Wrong. The problem is that Google has more than 144,000,000 pages indexed for the term Recipes. That’s a really HUGE number of pages. Market Samurai also tells me that the term is pretty competitive too, meaning lots of websites are targeting the term “Recipes”. Growing your blog to the point where Google would rank you in the first 10 positions is possible, but it would be really really hard and take you a long time. Not something I would recommend. A far better approach would be to pick a sub-topic or sub-category of Recipes and focus on it instead. Using Market Samurai again, I did a little research on “Diabetic recipes”. Diabetic recipes receives 1,627 searches per day and the term is far less competitive. Google shows that there are 7,440,000 pages indexed. See the difference? Being successful with this niche is far more likely, given the much lower competition. What are your interests? If you’re going to be writing frequently on your blog (the more frequently you write, the faster you grow) you better pick a topic that you like writing about. There is nothing worse than picking a topic you hate and having to spend 1-3 hours a day writing articles on that topic. Not only will you hate it, but so will your readers. They’ll pick up real quick on the fact that you aren’t enjoying what you’re writing about. Do you have knowledge or expertise? While not critical to finding your niche, I do recommend picking a niche topic for your blog that you have expertise or knowledge in. I say it’s not critical as you can certainly start a blog and share what you’re learning. I did that on GLBL, but it’s far easier to write about something you already know. Remember too the expertise is relevant. In many cases the people visiting your blog will know very little about the topic, so in order to write with authority and be an expert, you just have to know more than they do. Competition – Competition isn’t a bad thing, but I personally think the perfect niche is one that gets a decent amount of search engine traffic and has little to no competition. These niches are hard to find, especially when you factor in you should have an interest and knowledge about the topic. Great niches are still out there though, you just have to spend a little time looking for them. Remember too, that the number of sites ranking on Google for a topic doesn’t mean necessarily mean competition. There could be lots of sites focusing on the same niche, but they may be horrible or not well optimized for search engines. To compete, all you have to do is create a high quality site. You do that by providing high quality and useful content. Quality content is the silver bullet to being successful with your blog, don’t ever forget that. In real estate, it’s: Location, Location, Location. In blogging, it’s Content, Content, Content. Search Volume – Let me just say this right now and you’ll hear it many many times again from me: Don’t write for search engines, write for your readers. We do want to attract search visitors to our site though. Why? Because search engine visitors are the visitors that click on your ads. The more search engine traffic you have, the more money you earn. At this point you should have a topic in mind. The topic should be something you enjoy and that interests you. The topic should also be something you’re familiar with, knowledgeable about, or perhaps may even be an expert in. With that topic in mind, let’s explore how to do the Google search research I was using earlier in this article. Doing this same research for your niche will be the final key ingredient in answering the question: What should I blog about? Market Samurai, which I already mentioned. These tools are designed to help you research and find topics with high search volumes and low competition. Market Samurai and Long Tail Pro also both you find domain names, article ideas, monitor your competition and even help you write content. If you are serious about blogging and making money blogging, I would strongly recommend you purchase either Market Samurai or Long Tail Pro. While the Adwords Keyword Tool is free, the data and options it provides are far less. As I mentioned, I currently use Market Samurai, which I bought a number of years ago before Long Tail Pro came out. If I had to make the choice now, I would go with Long Tail Pro. LTP is more modern, and faster than Market Samurai. But both tools are great, and I find Market Samurai to be incredibly valuable. By default, the searches in these tools show you both the keyword you entered, plus data on related keywords. We’ll use these results to find possible niches. For example, if you enter Recipes, you’ll get a large list of terms relevant to recipes. This list is packed full of niche options. Look at the data, pay attention to the number of searches and the competition for that keyword. Now, what you need to do is write down a list of ideas, and pick the ones that you are interested in and have knowledge about. You can use your head, the tools I mentioned above, or better yet a combination of both. Now, we’ll need to refine the list some, so that we’re in a less competitive niche. You do this by looking at the Number of Searches shown by the tools. For each search, a field is shown that tells you the number of times people search on those terms. You want to look for something in the 1000 – 10,000 range per month. 1000 is big enough to where you can get a good amount of search traffic, but not too small to where your blog growth isn’t limited. Staying at less than 10,000 will allow you to compete but avoid niches that would require a great deal of work to be successful. Personally, I shoot for 4,000 – 6,000 which I’ve found to work very very well. If you elected to purchase either Market Samurai or Long Tail Pro, they offer an additional field that will let you gauge how competitive the search term is. You want something in the 4,000 – 6,000 searches per month range, but with low competition. With the niche candidates written down and search volumes and competition determined, the time has come to pick your niche from the list of candidates. Key tip: Don’t over think this, and don’t spend more than an hour making a decision. People get really hung up here. They hesitate and are afraid to pull the trigger. I’ve seen clients fail to start a blog just because they could never get past this decision phase. My advice: Just go with your gut and pick one. Be ok with knowing that the decision might not the right one. Even if you make the wrong decision, you learned, gained experience and starting new sites is easy. For every five blogs I build, I generally only get 1 that does well and I’m personally happy with. This is normal. Head back over to my How to start a blog page to see what the next step is. Wow! This whole article was so helpful, and the Adwords niche-narrowing tips were a gold mine for me!! I never would have known that on my own, but that process will be an amazing jump start for me as I attempt to reach my audience! My goal is to help others with content~~generating profit is very secondary at this point~~yet I definitely will be taking advantage of these tips, and feel they will really help my family receive a twofold return for the time I will be spending! I feel very blessed to have found your site! Thank you! Also, as a believer in Jesus myself, I wanted to thank you for representing Him wonderfully in the excellence, helpful intent and positive tone of your work! Be encouraged and thank you for the great site! Blessings to you and your family! Hi, first off, thanks for all this work you’ve done to help people with this! This is a really great tool you’ve made. Now, i’m trying to make word combinations for my niche, I find low competition and ~5000 global searchers, but i cannot for the life of me get word combos that are under 1 million results in google. You mention targeting for under 50,000 but i wonder if you meant 50 million? Hey Eric, you are most welcome. When I first read your comment, I didn’t understand what you met, I thought 1 million?? But sure enough, looks like Google has changed things up a little since I wrote this. They must be including content they previously didn’t include. I’ll need to edit the article. Given the size of their new index count, that tip probably isn’t even valid anymore. Just focus on the keywords tool, that should be sufficient. I have another tool I use for keyword research, but you have to buy it, so I tried to avoid suggesting it. Stay tuned, I’ll get this updated and when I do, shoot you an email.